This patient has Brugada syndrome. Regarding the “differential diagnosis” for the ECG above, the normal PR interval is 120-200 ms, with first-degree AV block being a duration longer than 200 ms, not present on this ECG. 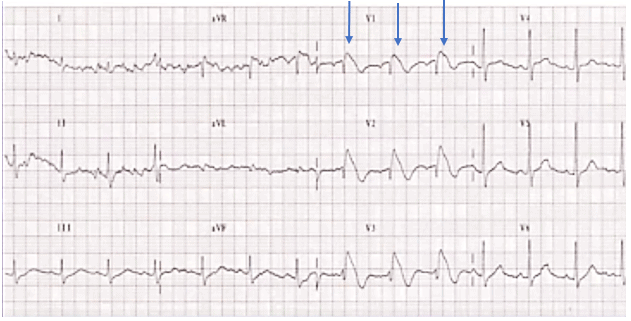 WPW is defined by a short PR, a delta wave, and a wide QRS complex—again, not present here. Could this be an anterior STEMI? Possibly…but the morphology of the ST segments is different than typically seen with a STEMI; plus, the leads with ST elevation are curious—anterior STEMI generally involves leads V3 and V4, not V1-3, and…in a patient without chest pain, shortness of breath or sweating, this would be a very unusual presentation indeed! The final possibility presented is third-degree heart block, where there is no conduction of the p waves to generate a QRS complex. Third-degree (complete) heart block will have a P wave rate unrelated to the rate of the QRS complexes. This ECG has p waves conducted and related to the QRS complexes; this ECG is not complete heart block. This ECG shows Brugada syndrome defined by a symptomatic patient with right bundle branch block (RBBB) or incomplete RBBB in leads V1 and V2 with concurrent ST segment elevation. Acknowledgement: Image provided by Amal Mattu, MD.